Through the allocation of grants and sponsorship funds, the Society for Libyan Studies supports research activities ranging from excavations to workshops, training, outreach and conferences. Below are some of the more recent projects with which the Society has been involved. A more complete record of Society-funded research projects will be compiled and added to this section of the website at a later date. ‘Outside the Walls: Cyrene’s Suburban Zone between the Greek and Roman Eras’ by Mohamed Omar M Abdrbba, University of Leicester, School of Archaeology and Ancient History. Click here to read the research report, October 2018. ‘Mobility, identity and interaction of pastoral peoples within the Nile Valley’ by Dr Michael Jonathan Brass, UCL Institute of Archaeology. Click here to read a preliminary research project report, October 2017. Libyan Antiquities at Risk (The LAaR Project) is a six-month pilot project funded by the Society for Libyan Studies based at the University of Leicester. Its target is the recording and dissemination of information about Libyan funerary sculptures of the Hellenistic, Roman and late Roman periods, which are under threat of being sold on the illegal art market. Given the current political instability in Libya and the threats to which its archaeological heritage is exposed, the project’s intention is to create a website and associated database with descriptions and photographs of stone artefacts belonging to funerary monuments in Cyrenaica and Tripolitania. The principal aim of the project is to set up an online photographic reference collection which will help to safeguard the Libyan monuments threatened by destruction and looting. The database will have entries about each monument following a user-friendly format. This information will be primarily used to identify those objects which may be already circulating on the illegal market. Close collaboration with academics, the Libyan Antiquities Service, cultural heritage operators, police, professional antiquities dealers, museums and other institutions will be an essential part of this work. In addition, the database and website will represent a significant contribution to archaeological research in Libya and North Africa, since most of the evidence from ancient funerary monuments is unpublished or is only very briefly commented on in scientific journals and books. 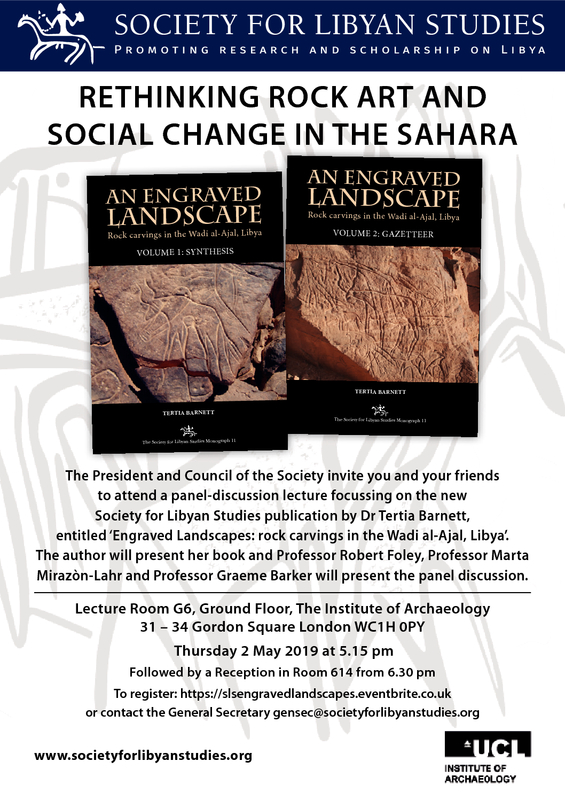 This project is funded by the Society for Libyan Studies – For further information please contact: Niccolò Mugnai (nm277@le.ac.uk) or Julia Nikolaus (jsn13@le.ac.uk). Click here to visit the LAaR webpage at the University of Leicester School of Archaeology and Ancient History website. ‘Early human dispersals and the Chotts Megalake in southern Tunisia’ by Prof. Nicholas Barton: Click here to read a preliminary research report. Click here to view a selection of images associated with this research. “Archive Research on Roman Housing in Cyrenaica” by Eleonora Gasparini: Click here to read the preliminary research report. Bulla Regia is an archaeological site in north western Tunisia, a former Roman city near modern Jendouba. Corisande Fenwick heads a team who are investigating a late Antique church and burials at Bulla Regia in order to examine questions of mobility, identity and community in Christian North Africa. “Architectural Decoration in Mauretania Tingitana (Morocco) and North Africa: A Comparative, Interregional Study across the Roman and Late Antique Eras” by Niccolò Mugnai (September 2014): Click here to read the research report. “Late Roman Commerce in the Metelis Region (Alexandria – Egypt): A study of North African and other Mediterranean Red Slip Wares” by Cristina Mondin, University of Padua, Italy (January 2014): Click here to read this report. The Society awarded a grant towards funding an interdisciplinary workshop on art and material culture in Ninth Century North Africa entitled: “The Aghlabids and their Neighbours: Art and Material Culture in 9th century North Africa” held at UNC-Chapel Hill Winston House, London on the 23rd-24th May 2014. The conference was organised by Glaire Anderson (University of North Carolina, Chapel Hill), Corisande Fenwick (University of Leicester) and Mariam Rosser-Owen (Victoria & Albert Museum, London). This event was co-funded by the Barakat Trust and the University of North Carolina, and was sponsored by the Spain North Africa Project. Click here to read the report of this conference. In May 2013, Niccolo Mugnai recorded over 500 specimens of architectural decorations from Banasa and Volubilis, Mauretania Tingitana, a Roman province located in northwestern Africa, coinciding roughly with the northern part of present-day Morocco. This research was part of a wider project cataloguing and analysing architectural decoration in Mauretania Tingitana. The 1950s excavations by Charles McBurney in the great Haua Fteah cave, situated on the northern shore of the Gebel Akhdar (The Green Mountains) in northeast Libya, revealed a deep (14m) sequence of human occupation from the Graeco-Roman to Middle Palaeolithic periods. As a result, it is commonly recognised as the most important prehistoric site in North Africa. In 2007 a renewed programme of archaeological and geomorphological investigation began, directed by Graeme Barker. Click here for more details. Interim reports can be found in Libyan Studies 2007-2012. Fieldwork in Fazzan has been carried out by Charles Daniels in the 1960’s and 1970’s, and more recently by David Mattingly on the Fazzan Project and the Desert Migrations Project. For more information see the publications ‘The Archaeology of Fazzan’, volumes 1–4, which members can order at discounted prices from the Society Bookstore. The material is variously housed in store-rooms in Libya and in the Society’s Archive in Leicester. Between 1952 and 1954, the Department of Antiquities at the Ashmolean Museum at Oxford carried out excavations of parts of the site of the Greek city of Euesperides situated on the outskirts of Benghazi. A new mission then excavated the site from 1995 to 2007, directed by the late John Lloyd, Paul Bennett and Andrew Wilson. This recent work is currently being written up for publication and interim reports are available in Libyan Studies, 1996–2007. In the late 1980’s, an extensive survey of the desert margins of North Africa was undertaken by a UNESCO team. This area is rich in archaeological ruins of the Roman period – with evidence of dense settlement 2000 years ago in what are now arid and hostile environments. The published report of these excavations (“Farming the Desert: The UNESCO Libyan Valleys Archaeological Survey”) can be purchased from the Society Bookstore. Some of the material is also stored in the Society’s Archive based in Leicester. Sabratha was a Phoenician trading-post that served as an outlet for the products of the African hinterland; it was part of the short-lived Numidian Kingdom of Massinissa before being Romanized and rebuilt in the 2nd and 3rd centuries A.D. Reports on Excavations at Sabratha carried out by K.Kenyon and J. B. Ward-Perkins in 1948-51 have been written up and published in three volumes (1, 2i and 2ii) of which the latter two were published by the Society and are available for purchase from our online bookstore (members) or Oxbow Books (non-members). Society excavations at Sidi Khrebish (Benghazi) have provided a full account of the Greek settlement and later Roman occupation of the city of Berenice. The published volumes provide the most significant interdisciplinary documentation of the archaeology of an urban site in North Africa, on a scale comparable to Carthage. The results can be seen in the Society’s publications, volumes I – IV, which can be ordered through the Society’s online bookstore. The Society-sponsored ‘De Africa Romaque’ conference was held in Leicester in October 2013. The objective of this event was to bring together postgraduate students, early career researchers and established scholars in the field of North Africa archaeology of the Roman period to explore the mutual relationships between North African peoples and Rome, between the 2nd century BC and the 4th century AD. The conference explored current questions within the study of North African archaeology, bringing the ‘local people’ back into research focus. Organised by Niccolo Mugnai and Julia Nikolaus, the conference is currently being developed into a Society Monograph, which will be published later this year (2015). Between May and December 2011, Dr Will Wootton of King’s College London, undertook two workshops for Libyan professionals in Libya, on mosaic conservation and preservation. These workshops, entitled “Conserving and Managing Mosaics in Libya: a New Collaborative Project” were sponsored by the Getty Institute and the Society. Click here to read a report of the findings of these workshops.